Since opening its doors in 2013, the branch has seen huge success and growth both in sales and lettings being part of an award-winning brand. The Erdington team are committed to guiding customers through the property process with an efficient, enthusiastic and helpful service. For sellers, there is an option of a no sale, no fee and for landlords we have flexibility to tailor make the perfect management option. Run by office director Justin Hipkiss, the branch specialises in sales, lettings, FREE valuations, financial services, mortgages, conveyancing, land valuations (plots) and new homes. The branch boasts a superb town centre location, situated within a pedestrianised area, with parking facilities close by. The Erdington team pride themselves on their commitment to excellent customer service, focusing on the entire customer 'journey' and experience, rather than simply selling or letting houses. As part of this, they adopt a proactive and flexible approach to viewings, including accompanied viewings, weekend opening hours and ensuring that all customers are put first. They endeavour to assist customers in their purchase, regardless of whether they are using the branch to buy or let their home or not. "Where I believe we stand out from the competition is the fact that within the branch you have the business owners, the people that pay the bills. The branch is family run having a wealth of industry experience combined with a large network under the Newton Fallowell brand I feel we can cater for everyone's needs. 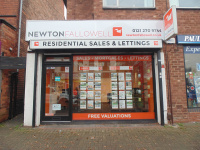 With Newton Fallowell Erdington clients get the personal touch of our local experienced team supported by the 45-branch network of the Newton Fallowell brand. The branch is a proud member of the Property Ombudsman. "Justin provided me with a fantastic service from the initial valuation, to selling my property and then completion. I would highly recommend to anyone looking to sell a property"
"Justin came out to see me and we immediately clicked. He was very proactive and enthusiastic. My property went on with the office and within a matter of days they had achieved an agreeable offer. Anyone looking to sell should definitely have Justin to value their property!" “I use Jon and Justin for the management of my property portfolio. They provide a fantastic service in all aspects. They are always available and extremely proactive in ensuring small problems do not become big problems. I would recommend the office to all landlords"